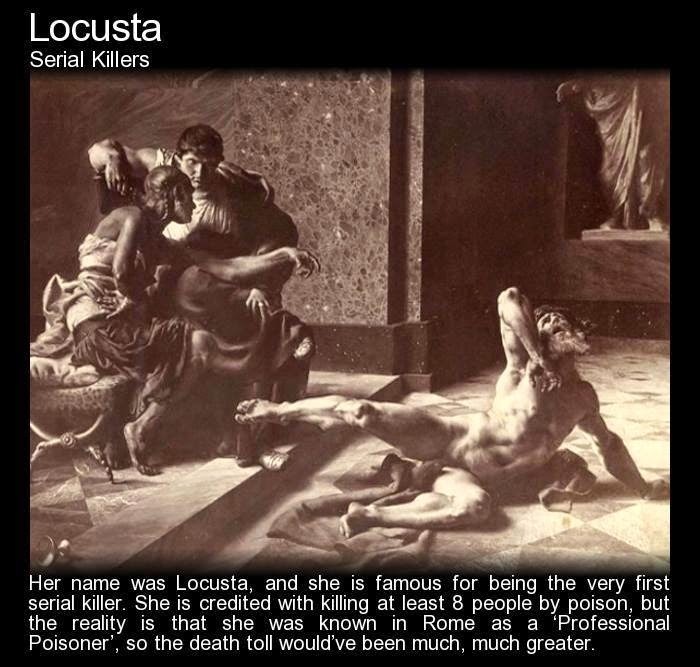 Serial killers have existed since the dawn of time, but the first recorded serial killer was a woman named Locusta – although she could also fall into the category of ‘contract hitman’ (or woman). Not too much is really known about Locusta, and a lot of the history surrounding her is conjecture. Locusta was born in the first century AD in Gaul, at the time an outer province of Rome, which is now known as France. She studied herbal lore as a young woman and acquired a thorough knowledge of plants and herbs in the surrounding countryside. At some point she moved to Rome. In her day-to-day dealings with the Roman people she learned that most were corrupt, and would not hesitate in hurrying the death of an acquaintance along. She realized there was a market for her herb-lore in such a greedy city, and before long had become a professional poisoner. Fortunately for her she had quite an influential clientele, and this helped her a great deal during the many times she was arrested. Life was dangerous for Locusta, but exciting – and all was going well and then, as legend tells it, she received a secret summon from Empress Agrippina the younger - a unique woman in Roman history, she was the sister of Caligula, the wife of Claudius, and the mother of Nero. Agrippina required Locusta’s services to remove the Emperor Claudius from this life – at which point her son Nero from her first marriage would take his place as Emperor. Locusta and Agrippina worked together to fool Claudius. While Locusta poisoned a big batch of mushrooms, Agrippina bribed the Emperor’s taste tester to disappear for the night, and once the mushrooms were ready, Agrippina served Claudius herself. The death was not pretty and definitely served Agrippina’s purpose. Legend also states that Locusta provided a ‘back up’ method of assassination in the form of a feather which also had a lethal dose of poison on it. Nero became Emperor at only 16 years of age and during his reign he frequently used Locusta for her skills. She was arrested several times throughout his rule, and each time Nero would arrange for her release. She was too important to die. Having the Emperor’s favour, Locusta lived in wealth and extravagance. She was also pardoned completely for all poisonings she had been charged with over the years. But unfortunately her good luck could not last. Eventually the Roman Senate condemned Nero to death (he was an absolute lunatic). Locusta provided him with a poison kit so he could do away with himself, but he was so rushed he left the kit behind and had to take his own life using a dagger. This left Locusta to the mercy of the people of Rome, and the new Emperor Galba. He embarked on a law-and-order campaign throughout Rome and publicly executed many "official" criminals. Locusta was among them. The method of her execution has caused controversy. There are many sources that say she was killed by being raped by a specially trained Giraffe. Did this actually happen? How did this story every come into existence? Pic: Locusta testing out poison on a prisoner.